The following is written not to high light our problems, as you all have plenty of your own, but to tell you of our solution that may be of help to you. I use to take pride that I could predict what would happen in the next year business wise in archery and in the country in general. By going to the trade shows, reading Forbes and the Wall Street Journal one could get a feel of what's going to happen. No more. Wild! With the stock market booming way beyond reality, commodities prices are at their lowest, (cranberries, wheat, corn, soy beans, apples, pigs, cattle, etc, farmers going bankrupted right and left) car, boat, sales at recorded high, fishing & hunting licenses on a down slope along with golf, tennis etc. Where's Archery? Wild! The scorn heaped on guns is intensifying. Join the NRA if your not a member! We are part of shooting sport and we need each other. There are a lot of single moms out there. Almost zero will approve of their kids getting in any shooting sports. Few single pops exist but if dad was a bow hunter this will transfer to Jr. And of the rest of the mom & dads (both working ) it's easier for them to let the kids surf the Internet, play computer games and other home entertainments than get to a range, or heaven for bid, go hunting! Wild! Space age materials & American ingenuity have created the fastest, easiest to shoot bows the world have ever had. Arrow & accessories have kept pace. On the other hand, traditional archery is at it's peak and climbing. Seems like putting more personal challenge into the art is satisfying in an inner unspoken way. Our feathers benefit from both direction archery is taken. Traditional Archery, for the obvious reasons. And high tech because of speed. Easton movies and our own photos show lousy guidance of plastic vanes at high speeds. The price of money is too high. If you're like most of us -- we owe the bank. Mr. Greenspan wants to cool the economy - He's looking at the stock market, apparently as there are a lot of holes that a big bunch of people are falling threw (farmers, small business people etc.) they don't need any cooling off - they need help and what does he give us? Higher interest rates! This isn't wild -- it's almost immoral. It's sad, uncalled for and down right dangerous. Consider yourself fortunate if you don't have labor problems. I was in Florida early this year when one of my vice presidents called to tell me we were down to a mere hand full of employees in one of our departments -- despite our advertising for help in 6 or 7 papers etc. We published a starting wage (highest in the area). And nobody came in. Our employees come from as far as 50 miles away - drive at their expense and transportation is a consideration. We tried to give them free gas to help them out but it's not legal (IRS rules). So what to do? The majority of our people come from 30 miles away (two large towns and a number of small towns) we thought of buying a used school bus and providing free transportation (as does a competitor company near by.) They are relatively cheap ($8,000) to buy but expensive to operate as the driver must hold a commercial drivers license CDL (truck drivers). It is hard to get an employee or two (back-up) who has a CDL so we took another direction. We bought two 15 passenger vans. Anyone with a drivers license can drive them which allows us to use employees. Of course we have to pay time and 1/2 for 1 1/2 hours it takes for the round trip. The employees keep them at home and we have a pick - up point (we use City Hall with permission). We work 4 ten hour days to save one trip per week. This gives our employees free transportation and we can write off the complete expense - vans, gas, maintenance- etc. Of course we bought used vans ($8,000 to 12,000 each) the employees just love them as the ride is much better than a school bus. Along with the van program we raised starting wages by $1.00 per hour and now have more applications to pick from. Note the word "application". When you advertise your ad must say "applications now being taken". This gives you the right to pick and choose who you hire. Do not advertise for "Help wanted". If you do you might have to hire the first person that shows up. How do I know ? We were threatened by a US Government suit for discrimination. We have been sued for age discrimination, product liability, yup - someone claimed a feather cut his thumb, millions of dollars for "False advertising ", numerous work compensation claims etc. We've never lost any of these cases, but defending ourselves is a built in business expense. Wild! Advice here? Fight them all. We are the largest user of turkey pointers in the world. Millions upon millions of feathers. Years ago feathers were much easier to acquire, but as the years went on the turkeys processing plants got fewer small ones and more large ones and they all would like to raise turkeys with out feathers! They want the food that is used to make the feathers converted into meat. The result is fewer & fewer, range birds (that allow the feathers to develop) and more & more confined birds. We buy from brokers who gather the feathers at the plants. The price of the soft feathers hips, backs, etc are at a record high in Asia. We routinely check the plants for the quality we demand so you can understand the shock I felt when I discovered that at some plants no pointers we being gathered at all. Zero. Hey -if we don't get the feathers were out of business and you won't have feathers. Reason for no pointers? Labor - they used what they had for the softs as they brought more money - and they couldn't hire labor for the pointers. Now what? Kinda makes one wish we were back at 7% unemployment. The brokers have a choice -- gather or let them go down the drain. We have no choice -- pay the price. You have a choice with a guarantee. We guarantee that regardless of what we have to pay we will never raise our prices during the year. We have a set price January 1st and must keep it all year. Many years ago we faced a crisis and raised the price about June. That won't work because it is not fair to you who have bid on arrows to other companies based on our January 1st prices and have catalogs printed with prices based on January 1st prices. Therefore we guarantee price protection all year, every year. Been there, done that, not good! Predictions: Archery & Bowhunting are not going to drop off a cliff. In fact, I see nothing but growth ahead. Maybe not as much as we want but continued growth. Some may come at the expense of gun hunting - pressure on it, but I tend to believe it will be in conjunction with fire arms. Running an archery business has never been a walk in the park -- it's hard and takes smarts but with the excellent programs AMO has its getting easier and that is all plus. Don't worry about the "Marts". In fact wish them luck. If their whole store was selling Archery you would boom! Let them have the first sale. - You'll get the second. (In fact, see if the mart will give out your cards and refer customers to you for service -- it has worked for some dealers.) Bowhunters need professionals like your store. And you know there are no professionals at the "marts". If they help build a bigger base, good. This base will come to you in a year or so. Archery is technical or traditional - they are neither and everybody knows it. And here another reason why your pro-shop won't go out of date. Being in the feather business we developed a branch that sold soft feathers from turkeys. These were used in the craft industry. After a few years things were going well -- nobody was getting rich but our bills were paid and a bit of money left over for church donations etc. We sold through reps who sold to jobbers & distributors, who sold to ma & pa stores and small 2 to 30 store chains. Michaels Crafts based in Dallas come along and created a nationwide chain, buying up the small 2 and up chains. The ma & pa were forced out of business because of the competition and the jobbers had no one to sell to - as did our reps so all went broke. And of course we lost almost all our business. Crafty's Featherworks is doing other things but the soft business is lost. I see nothing in the future of Archery that duplicates this disaster. Bowhunters need professionals period. Personal help and professional care cannot be provide by mass merchandisers -- only you can provide. Capitalize on it. That is not Wild! We've began using a new bag for 100 quantities. The new bag has a re-closable zip lock top, and black on white graphics in it's upper portion. The lower part of the Bag is clear, showing off the feathers. The top of the bag has a hole for pegboard display. 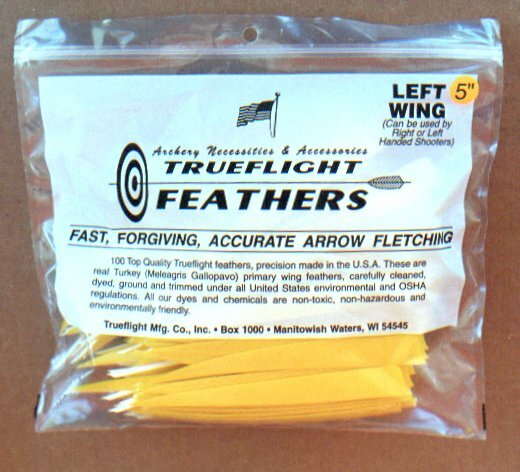 The text on the bag explains that a shooter can successfully shoot either wing, and clearly says these feathers are made in the U. S. A.
Trueflight Feathers on the Cover of ARROW TRADE! 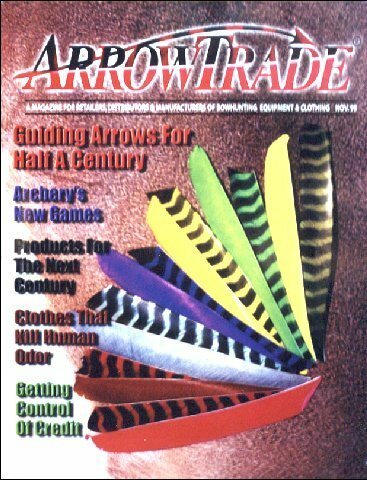 We were sure proud to see Trueflight Feathers on the cover of the November, 1999 issue of "Arrow Trade Magazine". Editor Tim Dehn wrote a very good company history and through report on the current state of the feather business. I have to mention, before Tim's article was printed, I went around warning folks here that there were sure to be a few errors in it. After all, I figured the national press gets things only half right... on a good day. Imagine our surprise when everything in Tim's article was exactly, 100% accurate! I only wish all news reporters would do as well. "Arrow Trade Magazine" is dedicated to news and advice for the entire archery industry. It is particularly helpful to archery dealers. Best of all, it's FREE to all archery dealers, distributors and manufacturers. Trueflight's web site, (http://www.trueflightfeathers.com), is being viewed by a steadily increasing number of visitors. We have also been slowly improving and adding information to the site. If you haven't checked it out lately, you might want to look at the Feather Facts page. We've added several photos including a close up of feathers in flight at 328 fps. Please note, we don't SELL anything from the site. It's purpose is solely to promote feathers and answer common questions about feathers. People interested in buying feathers or arrows fletched with feathers are always referred to their local archery dealer. We also feature examples of dealer fletched arrows on our Examples page. If you haven't already, you're welcome to send us a photo of a fletched arrow (preferably a close up of the fletching), along with your business name, address, phone number, etc. We'll add it to the "Examples" page as soon as we can. Thanks to all of you for keeping us so busy throughout this year. We greatly appreciate it. We still have problems with finding reliable employees and good quality primary feathers but thank God for giving us the people we have to counter these problems. I'm sorry for the delays that you might have experienced this year with your orders of Trueflight Barred and select Full Length feathers. It's very frustrating for all of us not to be able to ship orders in their entirety. Our demand for Trueflight Barred and select Full length have us throughout most the year resulting in overtime for us starting last January and continued into September. One way to help you avoid delays is to place your orders with us in the beginning of the year with release dates as you need them throughout the year. I would also like to reassure you that we are doing everything possible to be more efficient with our barred and full length orders for the up coming year. I'm usually always the first one to complain when I hear that prices will be going up again, but as always I have to take a step back when I realize that the cost of everything keeps going up in our country. Wages and raw stock usually top the list for us. Select full length feathers continue to be on of the biggest challenges for our Grinding Department. On an average day a full length operator will sort through five - twenty five pound boxes or 25,000 primary feathers to obtain between 2500 to 3000 select full length in their ten hour shift. That's not a lot of feathers when we have so many large full length orders to fill. We are very fortunate to have a few very patient, conscientious employees who seek out there select full length feathers. It truly amazes me that they can find the beautiful quality feathers that they do. Die cut operators usually have it a little better as the feathers they use have been already sorted by the grinding department. However, they are still required to sort for length and heavy oil lined feathers to get the best quality die cut feathers for our customers. By the way, we only take one cut from the heart of each usable feather. Grinding and Die Cut operators jobs would be a "piece of cake" if they were able to grind and cut every feather in their boxes. Unfortunately, because of the nature of turkey feathers that is not possible. Have you noticed that there seems to be a continued trend in Youth Archery programs throughout our country? It seems like just about every Archery Club has initiated some type of program to enable kids to shoot a bow. The National Wild turkey Federation does a marvelous job with their youth Jake program. It's not just shotguns either. I've seen a lot of archery equipment being introduced to the kids by their members. In fact, I seen photos of the A.M.O. Archery Alley being used in my turkey call magazine. I'm proud to say our state's Wisconsin Bowhunters Organization had made it a priority to have youth events at all of our major functions. W.B.H. is very fortunate to have so many of its members and statewide clubs supporting our youth programs. Some of the clubs have donated thousands of dollars earmarked for the promotion of youth archery. W.B.H. is very proud of our own Archery Alley, it has proved to be one very wise investment. We also have a policy to loan it out to clubs throughout our state. It has been used for such events like church picnics, home shows,3-D shoots and even for gun shoots like the new Ducks Unlimited Outdoor program. I never realized that so many duck hunters are also bowhunters. This year D.U. program which was held in Oshkosh, Wisconsin in late August proved to be a very busy time for those who managed W.B.H. booth and Archery Alley. Hundreds of kids got the chance to shoot a bow for the first time, and that my friends is what its all about. This past March at our annual W.B.H. convention I had the privilege of organizing and running an indoor Introduction to bowhunting for our youth ages 10 years to 16 years. Despite the limitations of being indoors for a program like this it was a great success. Over 100 kids plus their guardians were registered. Appleton's Paper Valley Hotel managements cooperation was outstanding especially when we hauled in such things like balsam and spruce trees, dirt for scrapes, bags of leaves, acorns, deer droppings,rubbed samplings, blind, tree stands and 3-D targets just to name a few. The kids went to seven different stations which includes 1- Laws & Regulations/A state Game Warden 2- Bowhunting equipment 3- Bowhunting clothing 4- A Bowhunting video, on (N.B.E.F.) one on one 5- reading deer sign 6- Archery Alley and 7-Building an Indian Arrow. We had a very tight time schedule which had to be followed almost to the minute. Each of the seven groups of 14 kids was given 25 minutes per station with 5 minutes to move. One of my biggest concerns was that each participate would have enough time to complete their make it and take it Indian Arrow which involved assembles the head and fletching with sinew. All the components needed to make this arrow were prepared in advance. Shafts we slotted and marked to receive the feathers and Indian arrow heads which by the way were made out of plastic - No slots were made on the nock end for safety reasons. I'm happy to say that every kid had more than enough time to complete his arrow thanks to seven super helpers at our arrow station. Parents were please and many wonderful comments were made including those from two of our guest speakers Mr. James and Dave Holt. Having them thank me was quite a welcomed surprise. I really started to get a big head when Glenn Helegland asked me if I could set up an Indian arrow building station for the kids who would be attending Deer Classic in Madison, Wisconsin. Unfortunately there was not enough time to prepare the materials needed to make the arrows. If any of you would like more information on how to put on an indoor youth program like this together. I would be delighted to share my ideas with you. This years Bowhunter Trade Show promises to be one of the best yet. The newly remodeled Indiana Convention Center & RCA Dome will house considerably more exhibitors on the new very large main floor. I encourage all of you to attend as it will prove to be an asset for you in the new year. Please don't forget to stop in and see us at the booth #1346. I just want you all to know that all of us at Trueflight are very dedicated to all of our customers. Our feathers might not be the biggest or most exciting piece if an archers equipment but we all are devoted to getting you the best quality feathers that are possible. You have my sincere promise that we will always strive to continue in this direction. On behave of all of our employees Thank You very much and May God Bless you throughout this year and into the next. Bob Link, G.M. & V.P. I'd like to thank everyone for all their orders this busy year. Especially, thanks for the advance orders. Advance orders are a great help to both me and Bob. All advance orders have priority in production and will be ready to ship on their release dates. It is also a great help to us if you send your orders to us filled out on our order blanks. This really helps avoid any confusion about your order. Be sure to indicate if you are ordering 100 packs or stock boxes. Feel free to photo copy our order blank, or let us know how many you need. We'll send them right out to you. We're happy to see many of you taking advantage of our toll free fax line (800-711-4216). We make it a practice to acknowledge by return fax or phone call all of the fax orders we receive. If you fax us an order and have not gotten an acknowledgment within a few working days, please check with us. It seems a small percentages of all faxes sent wind up "lost in space". If you don't receive an acknowledgment, your fax may not have gotten to us. Monty Browning -- A Cape Buffalo at 10 Yards! 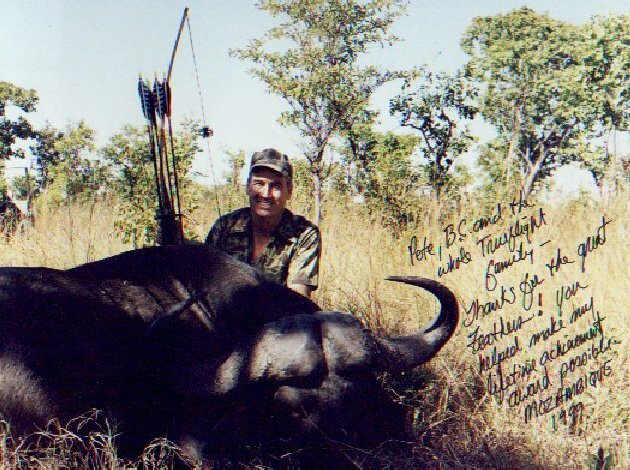 Monty Browning has amazed us all by shooting a monster African Cape Buffalo at 10 yards -- and surviving! The Cape Buffalo is often called the most dangerous animal in Africa. I'm sure you've read the Hemmingway stories, as I have. Of course, Hemingway was writing about gun hunting... not bow hunting! This has to be the ultimate achievement in bow hunting. There can't be more than a handful of today's bow hunters who've gotten a Cape Buffalo. And I have the feeling most of the "early" hunters were smart enough to avoid messing with any Cape Buffalo. The "Cape Buffalo Bowhunting" club has to be a mighty exclusive one. Monty shoots our Maxi-Fletch in the Trueflight Barred cammo pattern. Of course we know that the feathers on his arrows play only a small part in Monty's success. But we sure are proud to see our feathers out there doing their job, and being a part of such an exciting hunt. We're humbled by Monty's skill and confidence. Monty's world record Brown Bear was also shot at very close range . It seems that good hunters are able to get in close -- Monty's one of the best! Text and Photos copyright 2000, Trueflight Mfg. Co., Inc.